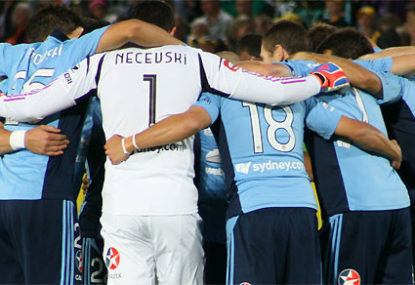 How soon is too soon for Sydney FC to panic? It is hard not to feel sorry for Sydney FC coach Ian Crook. With the eyes of the A-League on his team, they go and turn in one of the worst defensive performances ever seen in the competition. Crook was suitably apologetic following his side’s 7-2 shellacking at the hands of the Central Coast Mariners. “Firstly, I need to make an apology to our supporters who have been great all year and come up here in numbers again today,” Crook said in the post-match press conference. One wonders what Alessandro Del Piero made of the performance, with the Italian maestro one of several frontline Sydney players to miss the match through injury. Del Piero was obviously brought in to bolster the attack but right now it’s Sydney’s defence causing Crook and his coaching staff all kinds of headaches. After conceding an early lead, Central Coast’s equaliser just about summed up Sydney’s night. Despite four Sydney defenders facing three Mariners attackers, the Sky Blues twice failed to clear a ball into the box, ultimately allowing the precociously talented Tom Rogic to sidefoot home a classy finish. While Rogic’s decisive touch was a portent of things to come, there was no way his skidding drive should have been spilled by goalkeeper Ivan Necesvki for the Mariners’ second. Nor was there any need for defender Trent McClenahan to barge over Michael McGlinchey inside the box and concede a penalty shortly before half-time. McClenahan endured a nightmare evening and after Ali Abbas had pulled a goal back with a wonderful volley, the one-time West Ham man soon allowed the impressive McGlinchey to dance past him and lash home a superb fourth. And given that Crook had already switched to three at the back at half-time, there was simply no way for the Sydney defenders to keep pace with the Mariners’ fleet-footed attack. Even so, Rogic’s mesmerising feet in scoring Central Coast’s fifth deserve further scrutiny. Not only does the youngster possess the one trait which sets genuine playmakers apart – a seemingly infinite amount of time on the ball – he’s also a composed decision-maker who makes the right decision more often than not. Forget the fact he’s only 19, if Socceroos coach Holger Osieck is genuine about his desire to revitalise the national team, he should select the former Futsalroos star for the friendly against South Korea next week. And as poor as Sydney’s defending was against the Mariners, it was the pace and penetration of Rogic and McGlinchey which undid them time and time again. Crook said after the match he didn’t believe the lopsided scoreline came down to a lack of effort, however Fox Sports analyst Mark Bosnich was scathing in his assessment of the performance. “That was an utter disgrace. For those people to travel up that motorway and witness that score against one of their main rivals… I’m sorry, that just ain’t good enough,” a fired-up Bozza said on Fox after the match. That may be true, but it’s hard to see what Crook could have done differently in the face of such an attacking onslaught. Had the Sky Blues simply sat back in the second half and attempted damage limitation, the Englishman would have been accused of throwing in the towel. What Sydney desperately needs is the return of some key players, not least tough as teak central defenders Pascal Bosschaart and Adam Griffiths. And while five games into the season is no time to be calling an end to a team’s chances of playing finals football, surely the alarm bells are ringing at Allianz Stadium on the back of one Sydney FC’s worst-ever displays.